From the beginning we are pulled into a beautiful world with sounds of birds whistling sweetly in the background. A menu at the start allows viewers to select a chapter (story, nasheed or game). The feature presentations are stories of two Prophets of Allah, Adam and Nuh (spelled Noah in the DVD). Added features include two nasheed videos and two simple games. Young viewers will immediately be drawn to the DVD when they see groups of children talking together and to the camera about what they know of the story of the first man Allah created, Adam. Older children will find themselves following the text on the screen when the story itself is being narrated. Animations of nature provide the backdrop to the narration. In the second story (The Story of Noah), we see more animation with shadows and images of people (faces are not shown) but the text still appears for viewers to follow along. While younger viewers may not be able to read the text, they will still be captivated by the moving scenery. Viewers will welcome the challenge to remember some facts about the story of Adam through a quiz with Zaky (a bear that appears at the start). Younger children will like trying to figure out the names of some of the animals who boarded the ark in the story of Noah in the “Guess what is the Animal” game. The nasheed “I’m growing up, InshaAllah” by Shaheed Alkawn shares the moving story of Prophet Ibraheem (Abraham) and reminds viewers that they are growing up “to serve Allah.” Unfortunately the animation in the video tells of a different story (how the first filming of the DVD began) taking away from the powerful message of the nasheed. 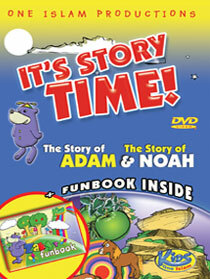 The “It’s Story Time: The Story of Adam & The Story of Noah”DVD (see a short clip here)is undoubtedly a high quality production from the graphics, images, sounds, games and script. I believe the appearance of the children and the added features including games really make this DVD unique. This DVD as well as others (including one of the story of Prophet Ibrahim) by 1 Islam Productions are a great addition to any home or classroom collection.